All Christians and many non-Christians are familiar with the story of how Christianity was founded. Christianity was founded by Jesus Christ. Back in the days, when Herod the Great ruled over Judea, there was a young virgin girl by the name of Mary. Mary was betrothed to Joseph. But before their wedding, by the power of the Holy Spirit, Mary became pregnant. Just before delivering her baby, Mary and Joseph were forced to travel all the way to Bethlehem to take part in a census. After struggling and failing to find lodging at Bethlehem, Mary gave birth to baby Jesus in a manger. Baby Jesus was visited by the the shepherds and the Magi or the three wise men from the east who brought him gifts. The evil King Herod learned that the messiah has come to this world and attempts to kill Jesus by killing all the infants in Bethlehem. Warned by the angels, Jesus's parents escape to Egypt and Jesus survives! At the age of thirty, Jesus was baptized by John the Baptist. And then Jesus started his three year long ministry. Jesus along with his twelve disciples, went on to preach all over Galilee, the word of God. He performed many wonderful miracles and signs. He walked on water, cured the blind and the lame. He fed thousands with a handful of bread and fish. He cast out demons and brought the dead to life. The Pharisees and Sadducees did not like this and conspired to kill Jesus. During the time of the passover, with the help of the traitor Judas, they brought Jesus to trial. They pressurized Pontius Pilate, the Roman Governor into crucifying Jesus. Jesus died on a Roman cross. With the passing of the Son of God, the earth trembled and the sun went dark for three hours! On the third day, Jesus conquered death and rose again! This gave the disciples Peter, James, John and the rest of the gang a second wind. With the power of the Holy Spirit in them, they preached the teachings of Jesus. 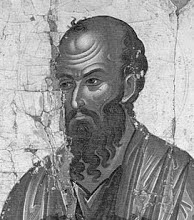 Apostle Paul, though originally a violent persecutor, had a vision of Jesus and got converted to Christianity. Peter and Paul took the new religion to Rome. The disciples took the word of God far and wide with Thomas going all the way to India. Peter became the first Pope of Rome. Matthew and John, Mark and Luke meanwhile, wrote the four Gospels which give us four different points of views of the life of Jesus. Paul and Peter and James and Jude wrote epistles to the Christian communities which also survive to this day. The religion spread far and wide and by the fourth century, it became the dominant religion in the Roman Empire.